A personal statement of class, distinction & elegance. Today’s modern weddings are a unique blend of cultures with a personal tribute to traditions. Weddings are an opportunity for the bride and groom to make a statement of style as they embark on their new life together. CountDown Events professional planners will ensure that every aspect of your wedding is planned and executed with the utmost perfection from start to finish. Every element, large or small, contributes to the success of your celebration. From planning your engagement party to wedding site selection, dress fittings to menu planning, vendor selection to family mediation, all services offered by CountDown Events are customized to your distinct style, needs and expectations. Armed with a wealth of creative knowledge, extensive project coordination experience, an invaluable and diverse list of industry contacts, combined with meticulous attention to detail, the coordinators at CountDown Events ensure that your vision is brought to life beyond your imagination, creating a most memorable event. Now that all of your planning is done, let our professional planners help you orchestrate your wedding day to allow you to spend this cherished time with your loved ones. Your personal planner will contact your vendors and review all of the agreements in order to develop a detailed wedding day schedule – acting as the on-site wedding day director, troubleshooter and calming force behind the hectic activities of your day. CountDown Events’ “Day of Perfection” planner will ensure that all last minute details are attended to so that you and your family can simply relax and enjoy your celebration, knowing that your wedding is being managed by a professional. Making your wedding a personal, momentous experience takes time, effort and inspiration. Creating it from a distance takes expertise! Imagine the excitement of traveling to a beautiful destination to exchange your wedding vows. If guests must travel anyway, why not to an exotic location such as the stunning beaches of Hawaii? CountDown Events’ local and global connections allow the planners to make the logistical arrangements so that you can just relax and enjoy your special day. British Columbia also offers extraordinary venues to host your wedding, whether it is in Whistler, one of the world’s top ski resorts, the heart of the Okanagan, or Vancouver; BC boasts the most spectacular hot spots for weddings. This luxe service was introduced in response to the call from brides and grooms for personal assistance with wedding fashion and styling. 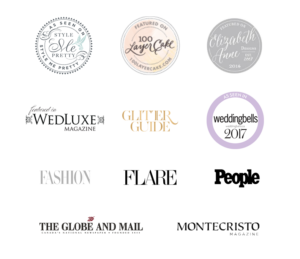 CountDown Events has partnered with the industry’s top stylists to offer a range of services such as chauffeured shopping extravaganzas, bridal party accessory and attire selection and photo shoot styling. Working closely with salons, personal wedding stylists consult on which gowns best suit the theme of your wedding and the styles and fabrics that are most flattering for each bride. Whether looking for timeless elegance or a fashion statement, your stylist will help you shine as you prepare for the most important day of your life. The designers and coordinators at CountDown Events are inspired by challenges. Recently, a groom sought help to come up with an amazing gift for his bride-to-be, one that she would treasure for years to come. Through a partnership with one of the most talented visual artists in Vancouver, the team at CountDown Events conceived a magnificent idea – a dream-like painting of the groom’s favourite photograph of his bride! The couple was overjoyed! Whether you are engaged, newly married or are about to celebrate a special anniversary, this gift can be the ultimate symbol of the most important day of your life.